Former PAS member and PAS President, Frank Castagna, passed on 12-20-18. His wife, Margaret, was able to get in touch with Gabe Dickens yesterday and Gabe in turn was able to let a few of us know about this. Frank joined the PAS in or about 1990 and remained a member until 2017. 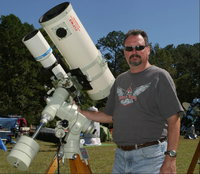 For many years he was an active participant in PAS events and was a regular attendee at the Deep South Star Gaze. At my request he was the Deep South Star Gaze group moderator. Six years ago Frank had to undergo a liver transplant and in the same year he and his wife Margaret lost their only child, Frank Jr.
At this time I have no details about funeral arrangements, I know that Leitz-Eagan is in charge of that and I should receive an email notification about plans. When I receive more information I will post it here.